Clown Fun Indeed! - ANd You deserve some Fun. - Welcome to Fun Clown Stuff! You will find educational videos here as well as classic comedy from the greats of all time. We hope this inspires you as it entertains you. Laughter is good for you. Laughter helps you to have a joyful heart. As you observe the comic greats of yesteryear, have fun and let their comedy be a springboard to your comedy. Don't copy what they do, or how they do it, rather, be inspired to go forward with your own comic style. Enjoy these Funny Clowns from around the world. Consider joining the World Clown Associatioin... they are a great bunch of funny people who bring joy and laughter to children of all ages. 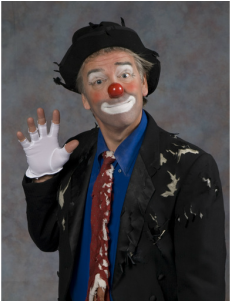 Barry is a hoot and was the featured performer at the World Clown Association Convention in Chicago in 2014. He was with the Big Apple Circus in NYC for 25 and their head clown. Here in one of the great European Clowns on stage in a theatrical setting. One of the Greatest Clown of all time - Otto Griebling. He made audiences laugh for many decades in Circuses around the world. Otto once said, "If you find that you are able to make people laugh... it is God's gift." Charlie Rivel The World famous clown with a circus ring surrounded by people who love his comedy clowning. Enjoy this Fun and Funny Musical Clown from Europe. Fascinating Musical Clown Mikhail Usov delights an audience with his funny antics. Crown Prince of Magic - The Great Tomsoni & Co. This fabulous act was a ever present act at many magician's conventions. Thomsoni was Johnny Thompson, an expert magician who presented amazing tricks with his own original comic methods. His appearing doves are done with grace and perfection. He is clearly a great magician, who has chosen to entertain as well as amaze. Observe, laugh and have fun with one of the great comedy acts. This funny Frenchman's act took him around the world. His facial expressions are priceless. Avner was the featured performer at the World Clown Association's conference in Winnipeg. He is a fascinating physical performer and really works the audience. Discover why audiences around the world have laughed at his antics. Nolo and Pepi Diaz with José Llata were the characters who played as a part of "Rudi Llata", one of the greatest European clown teams. 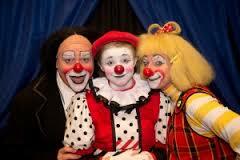 Mark Anthony was a great Ringling clown and is in the Clown Hall of Fame. He was known for his amazing foam props. Here is a quick clown bit you might enjoy. Check out Jan Damm's amazing and fun performance. Buster is one of the greatest of the Silent Era Comedians. Houdini gave him the nickname "Buster" as a very young age when Buster was a child on the vaudeville stage. This is a collection of some of his classic pratfalls. Buster was a highly inventive and creative genius. Arthur Pedlar recalls working with Buster in the French Circus in the 1950's. A brilliant comic performer! Travel back in time to 1931 and see this complete performance by one of the top clowns of all time, Grock. This is in French and has a lot of vocal humor in it. It lasts an hour but for those who want to study, this is a fascinating tour through time. Enjoy some old time clown antics with this unusual stunt. This is an audition tailor from an agency that books European Circus Clown Acts. Thanks for visiting and remember - Laughter is good for you ... LIKE MEDICINE. Watch the fun as these two hilarious clowns entertain at the library. EThe clown antics are hilarious in this act for the circus. The show was produced by Circus Stars Productions and all the acts come from Talents & Productions.